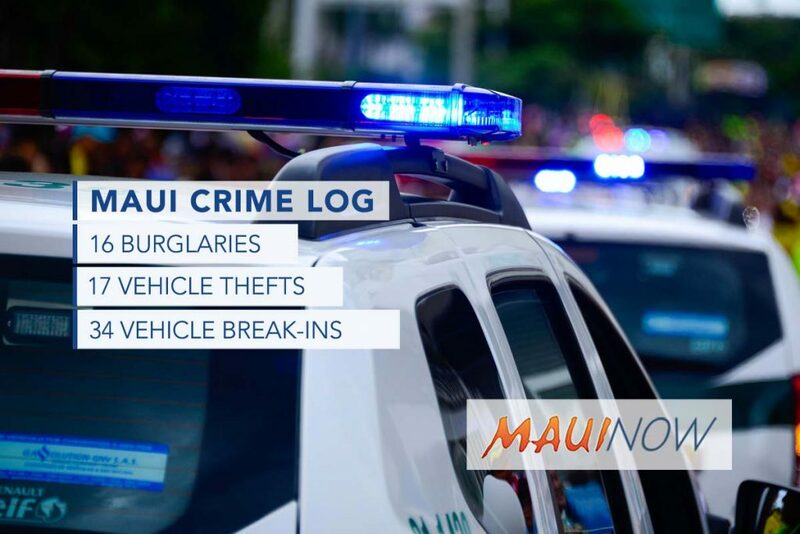 Maui police responded to 11 burglaries, seven vehicle thefts and 33 vehicle break-ins in Maui County over a seven day period from March 17 to 23, 2019. 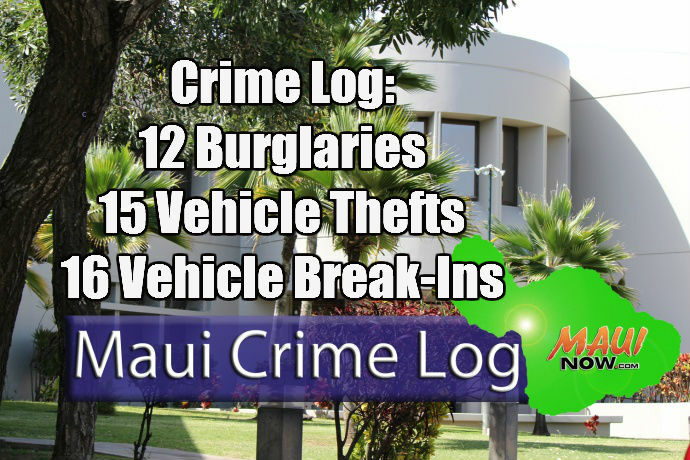 Burglaries and vehicle break-ins were up and vehicle thefts decreased from week before levels. Burglaries were up +57% from the week before when seven incidents were reported over the seven day period. Vehicle thefts were down, -42% from the week before when 12 incidents were reported; and vehicle break-ins were up +200% from the week before when 11 incidents were reported. Monday, March 18, 3:38 p.m.: 100 block of Nohea Kai Dr, Kāʻanapali. Residential, unlawful entry. Wednesday, March 20, 6:43 a.m.: 405 Ala Makani St, Kahului at Group Builders Inc. Non-residential, forced entry. Saturday, March 23, 5:22 a.m.: 275 Kaʻahumanu Ave, Kahului at Queen Kaʻahumanu Shopping Center. Non-residential, forced entry. Saturday, March 23, 7:27 a.m.: 380 Alamaha St, Kahului. Non-residential, unlawful entry. Saturday, March 23, 9:01 a.m.: 145 Hoʻokele St, Kahului. Non-residential, forced entry. Saturday, March 23, 4:33 p.m.: 100 block of Ritz Carlton Dr, Kapalua. Residential, unlawful entry. Tuesday, March 19, 8:40 p.m.: 2700 block of S Kīhei Rd, Kīhei. Residential, unlawful entry. Thursday, March 21, 10:02 a.m.: 2900 block of S Kīhei Rd, Kīhei. Residential, unlawful entry. Friday, March 22, 2:21 p.m.: 200 block of Halona St, Kīhei. Residential, attempted entry. Saturday, March 23, 5:10 p.m.: 1600 block of Akina St, Kīhei. Residential, forced entry. Thursday, March 21, 8:56 p.m.: 4200 block of L Honoapiʻilani Rd, Nāpili. Residential, unlawful entry. Friday, March 22, 9:51 a.m.: 100 block of Halelo St, Kāʻanapali. MSL068 2002 Ford Ranger, black. Sunday, March 17, 11:42 a.m.: 390 Papa Pl, Kahului at Sunbelt Rentals. MBX568 1996 Honda Civic, white. Sunday, March 17, 3:56 p.m.: 300 block of Hoʻohana St, Kahului. MMC059 2004 Hyundai Sonata, white. Tuesday, March 19, 2:44 p.m.: 400 block of Alamaha St, Kahului. 983MDN 2006 Toyota Tundra, light blue. 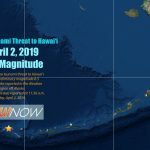 Thursday, March 21, 10:17 p.m.: 70 E Kaʻahumanu Ave, Kahului at Maui Mall. M00611 2015 DAIXI moped, red and black. Friday, March 22, 4:58 p.m.: Kūihelani Hwy / Puʻunēnē Ave, Kahului at Park & Ride. MLV630 2004 Toyota Tacoma, black. Wednesday, March 20, 9:24 a.m.: 100 block of Wilihona Pl, Waikapū. LBE462 2011 Kia Sorento, black. Friday, March 22, 11:43 a.m.: Hāna Hwy, Haʻikū at the Bamboo Forest. 2017 Hyundai Sonata, white. Friday, March 22, 6:48 p.m.: Hāna Hwy Haʻikū at the Bamboo Forest. 1999 Ford Ranger, red. Saturday, March 23, 9:45 a.m.: Hāna Hwy / Kai Huki St, Haʻikū. 2016 Honda Accord, black. Monday, March 18, 6:33 a.m.: 600 block of Kaulana St, Kahului. 2017 Dodge Ram 1500, black. Tuesday, March 19, 3:16 p.m.: Kūihelani Hwy / Puʻunēnē Ave, Kahului at Park & Ride. 2017 Hyundai Elantra, blue. Tuesday, March 19, 5:33 p.m.: Hāna Hwy. 2018 Cadillac XTS, silver. Wednesday, March 20, 10:02 a.m.: 100 Pakaula St, Kahului at Home Depot. 2017 GMC Yukon, white. Thursday, March 21, 12:11 p.m.: 100 block of S Wākea Ave, Kahului. 2002 Ford Ranger, green. Thursday, March 21, 5:04 p.m.: 29 Alahao St, Kahului at Kanahā Beach Park. 2018 Dodge Charger, white. Friday, March 22, 7:54 a.m.: 181 Dairy Rd, Kahului at Tire Warehouse. 1996 Chevy S10, white. Friday, March 22, 7:54 a.m.: 181 Dairy Rd, Kahului at Tire Warehouse. 1992 Mazda B2600, blue. Friday, March 22, 7:54 a.m.: 181 Dairy Rd, Kahului at Tire Warehouse. 1999 Chevy C6500, blue. Friday, March 22, 10 a.m.: 355 E Kamehameha Ave, Kahului at Kahului Ale House. 2009 Ford Ranger, red. 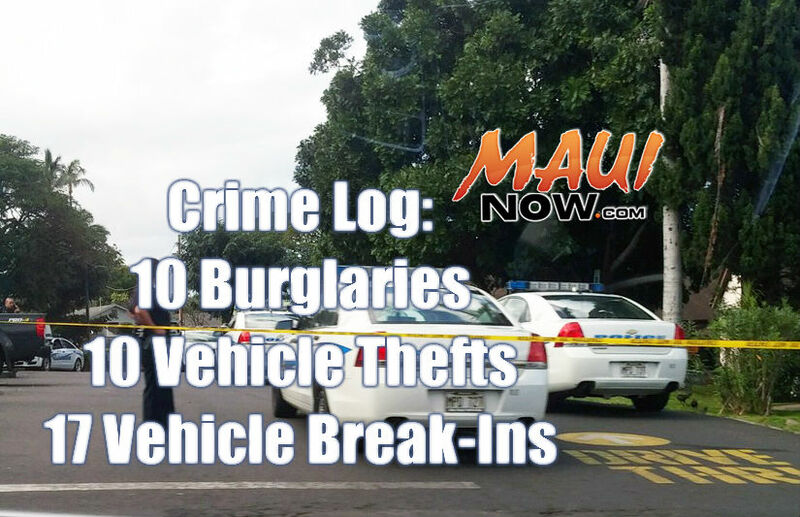 Saturday, March 23, 8:01 a.m.: 400 block of S Kamehameha Ave, Kahului. 2014 Honda Civic, silver. Saturday, March 23, 8:01 a.m.: 400 block of S Kamehameha Ave, Kahului. 2011 Nissan Frontier, gray. Saturday, March 23, 11:33 a.m.: 200 block of Alamaha St, Kahului. 2002 Ford Ranger, green. Monday, March 18, 2:50 p.m.: Kanani Rd / Kanoe St, Kīhei. 2004 Chevy Impala, silver. Sunday, March 17, 9:06 p.m.: 1287 Front St, Lahaina at Fridas Beach House. 2018 Dodge Grand Caravan, gray. Monday, March 18, 8:25 a.m.: 820 Olowalu Village Rd, Lahaina at Olowalu Store. 2011 Scion XB, tan. Saturday, March 23, 12:07 p.m.: 1285 Front St, Lahaina at Aloha Mixed Plate. 2018 Dodge Grand Caravan, black. Wednesday, March 20, 5:22 p.m.: 11 Māʻalaea Boat Harbor Rd, Māʻalaea at Māʻalaea Harbor. 2018 Nissan Armada, silver. Thursday, March 21, 3:44 p.m.: 192 Māʻalaea Rd, Māʻalaea at Maui Ocean Center. 2017 Dodge Charger, gray. Tuesday, March 19, 3:07 p.m.: 56 Hāna Hwy, Pāʻia at Pāʻia Municipal Lot. 1994 Ford Ranger, white. Wednesday, March 20, 10:52 a.m.: 19 Hāna Hwy, Pāʻia at Pāʻia Bay Park. 2002 Honda Civic, green. Saturday, March 23, 11:40 a.m.: 48 Nonohe Pl, Spreckelsville at Maui Country Club. 2011 Ford Ranger, silver. Sunday, March 17, 10:05 a.m.: 1000 block of Onaha St, Waiehu. 2008 Ford F550, maroon. Thursday, March 21, 10:24 a.m.: 3572 Wailea Alanui Dr, Wailea at Ulua Beach. 2007 Honda Accord, blue. Monday, March 18, 3:55 a.m.: 100 block of Kopi Ln, Wailuku. 2004 Honda Pilot, white. Monday, March 18, 3:55 a.m.: 100 block of Kopi Ln, Wailuku. 2006 Ford Ranger, white. Monday, March 18, 9:46 a.m.: 370 Kehalani Village Dr, Wailuku at Foodland Kehalani Village Center. 2006 Ford Ranger, silver. Monday, March 18, 10:18 a.m.: 1140 ʻEha St, Wailuku at ʻĪao Parkside. 2011 Ford Ranger, blue. Monday, March 18, 11:05 a.m.: 100 block of Kapi Ln, Wailuku. 2002 Ford Ranger, red.Thursday, March 21, 9:43 a.m.: 200 S High St, Wailuku at Maui County Building. 2006 Jeep Wrangler, white.